For this series, I am debating hosting several times a week/daily on weekdays. That way during the weekdays you'll be writing one notecard each day about what you did that day/what you want to talk about. 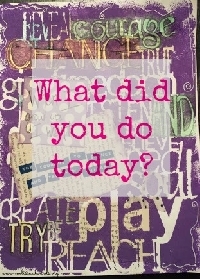 Fill a notecard [the fold in half kind] up with what you did for that day. Fill up the whole notecard! Don't just write a couple sentences! Talk about whatever you want to vent about from your day to your partner. The send deadline will be two days after the signup deadline date. This way, in case you can't get it out the very next day you will be able to send the day after. have some fun and vent!